An aerated lagoon or aerated basin is a holding and/or treatment pond provided with artificial aeration to promote the biological oxidation of wastewaters. There are many other biological processes for treatment of wastewaters, for example activated sludge, trickling filters, rotating biological contactors and bio-filters. They all have in common the use of oxygen (or air) and microbial action to biotreat the pollutants in wastewaters. Ponds or basins using floating surface aerators achieve 80 to 90% removal of BOD with retention times of 1 to 10 days. The ponds or basins may range in depth from 1.5 to 5.0 meters. 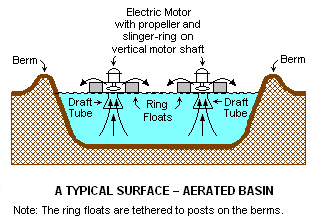 In a surface-aerated system, the aerators provide two functions: they transfer air into the basins required by the biological oxidation reactions, and they provide the mixing required for dispersing the air and for contacting the reactants (that is, oxygen, wastewater and microbes). Typically, the floating surface aerators are rated to deliver the amount of air equivalent to 1.8 to 2.7 kg O2/kWh. However, they do not provide as good mixing as is normally achieved in activated sludge systems and therefore aerated basins do not achieve the same performance level as activated sludge units.